This morning, I was looking to give the gift of chutneys and relishes, I canned last fall, to a neighbor who did me a favor. I whipped up a list of sixteen ways to eat it because people always ask, “How do I eat it?”. The true answer is any way that you like it. When I went to see what I had from last year, it turned out that I have quite a bit left over. Looks like I’m going to have to find people to give it to. If you see me, ask if I might have a jar in my purse. If I do, it’s yours. 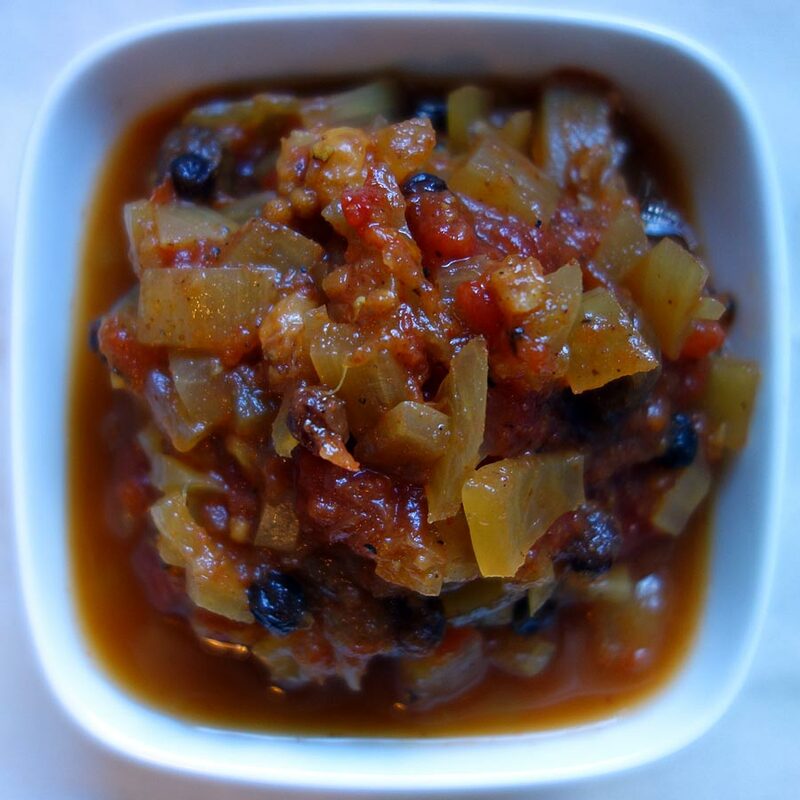 If you don’t have any on hand, make Divalicious Ruby Sun Splash Relish: It’s an easy-to-make tomato relish with curry and oranges. I use canned tomatoes so you can make it any time of the year. I served it in my show “Say Cheese: a tongue-titillating tasting of artisan cheeses, wines and the songs they inspire”. It was almost more popular than the cheese platter. One of my favorite snacks is crackers topped with avocado, Dijon mustard, mashed sardines and Divalicious Ruby Sun Splash Relish. I know, it sounds a little weird, but it’s a “mouthgasm”. 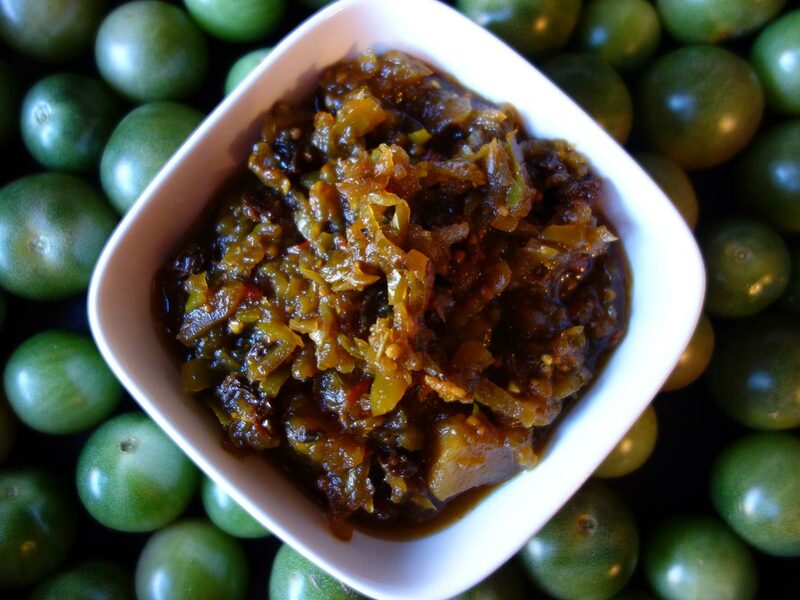 You can use these tips with my 4G Chutney with green apples, green tomatoes, green chilies and green mint; my Ginger Bred Chutney with tons of ginger, pineapple, apples, and grapes; Brooklyn Purple Chutney with Concord grapes from my garden and other chutney recipes. Puree it and glaze meat, roasted sweet potatoes, butternut squash, etc. Puree it and use as a dipping sauce for egg rolls, samosa, any fried food! I created this recipe when I lived in Australia and introduced it to the audience during my first U.S. show “Say Cheese: a tongue-titillating tasting of artisan cheeses, wines and the songs they inspire” as a condiment to have with the cheese platter. Skin, seed and chop the tomatoes coarsely. Make sure the stem section is removed. Place tomatoes in a 5-quart saucepan and add the remaining ingredients. Bring to a slow boil for 5 minutes. Simmer until reduced by 1/4 in volume, stirring regularly and bottle. To bottle: Preheat oven to 325 degrees. Have a small pot of simmering water on the stove. Wash, rinse and drain canning jars and lids. Line a sheet pan with a layer of paper towel. Place jars on the paper towel so they are not touching. Heat jars in the oven for 10 minutes, cool slightly, then pour hot relish into the warm jars. Place flat lids on each jar. Screw on bands to seal, but don’t over tighten them. Arrange jars right side up in a canner and add water so it’s at least one inch above the jars. Bring to a boil and continue boiling for ten minutes. Cool jars on a rack. Store in cool place. You can use fresh or canned tomatoes. The end of tomatoes brings me to tears. But the bright side is chutney. I rescue the green tomatoes and I make 4G green tomato chutney. Prepare the spice bag by tying the spices in cheese cloth or a large tea strainer that will not open. Add spice bag. Bring to a simmer and cook for about two hours. Remove spice bag and cool slightly. This is my original recipe. When I decided to try to make chutney from the grapes a few years ago there were no recipes for grape chutney online. The recipe changes slightly each year and this one made about 8 quarts of chutney. I had to start it in two pots and I cooked it down to one. I call it Brooklyn Purple. To slip the skins off the grapes, you pinch each grape and pop the pulp into a medium pot and keep the skins in bowl. To process the pulp cook, heat to a boil on a medium-low flame, stirring periodically until it liquefies. Pass through a strainer and discard seeds. Mix all the ingredients in a large stock pot or two big pots. Heat to a gentle boil on a medium-low flame; be very careful to stir it periodically until the chutney turns completely purple and it’s the desired consistency. This recipe took about 3 hours. To sterilize jars: Clean jars with soapy water and rinse well. Place them on a roasting pan or sheet pan lined with wet paper towel. You can up them upright in the oven. Make sure they are not touching each other. Cool jars on rack. Store in cool place for at least one month before eating.